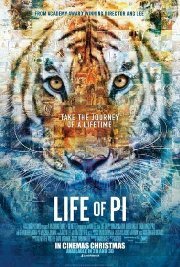 Based on a best-selling novel, and previously considered un-filmable until Oscar-winner Ang Lee took a look, the story concerns a young man adrift at sea for 277 days, with only a hungy Bengal tiger for company. His family used to run a zoo, and they were en route to Canada with some animals when disaster struck, leading to his predicament. How he and the tiger manage the situation fill the bulk of the film, and although the plot seems threadbare, it has generally been well-reviewed. This film is releasing in both 2D and 3D, this is the 3D version. The 3D version is generally recommended. Mature Accompaniment under 10 (Violence, Prejudice). I am Tiger, hear me roar!